Grote Reber built a parabolic reflector of 10 m diameter in 1937 and started radio astronomy with the publication of a map the “radio sky” at about 2 m wavelength in 1940. 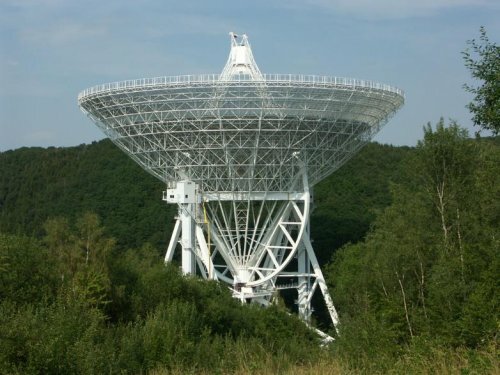 Radio astronomy developed quickly after 1945 and the first large reflectors appeared in 1956 -1961, operating at wavelengths of 20 cm and longer. A trend to shorter wavelengths and larger reflectors pushed structural design to include precision in addition to stiffness. A breakthrough was achieved in the mid-sixties by the concept of homologous deformation and the use of advanced finite element analysis programs. Later materials, such as carbon fiber reinforced plastic, were introduced to control temperature effects. More recently active control and on-line metrology have been applied to reach demanding specifications. The largest fully steerable radio reflectors of 100 m diameter can be used to a wavelength of less than 1 cm, while the most precise reflectors of 10-15 m diameter operate at 0.3 mm (1 THz). In my talk I shall review the development of the design methods over time by example of selected radio telescopes where new design or material choices were made. The introduction of the homology principle with its application to the Effelsberg telescope opened the door to highly precise, large telescopes for wavelengths as short as one millimeter. Aspects of the MRT (Millimeter Radio Telescope, Spain), LMT (Large Millimeter Telescope (Mexico) and ALMA (Atacama Large Millimeter Array, Chile) will illustrate the current state of art.